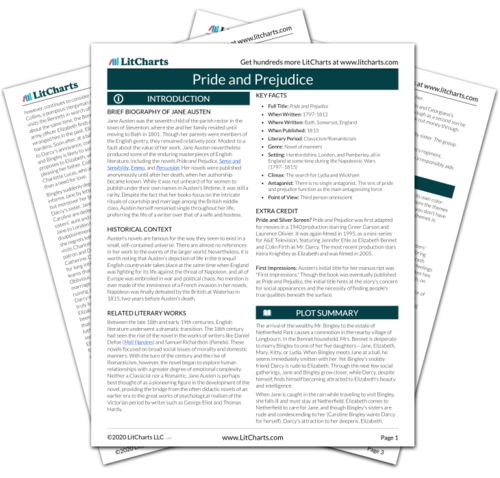 Instant downloads of all 946 LitChart PDFs (including Pride and Prejudice). 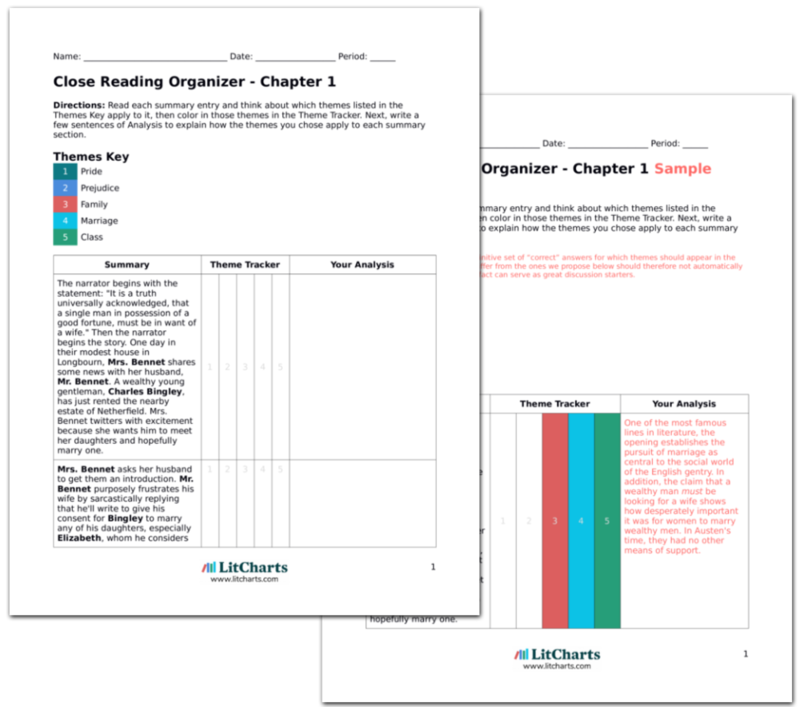 LitCharts assigns a color and icon to each theme in Pride and Prejudice, which you can use to track the themes throughout the work. The narrator begins with the statement: "It is a truth universally acknowledged, that a single man in possession of a good fortune, must be in want of a wife." Then the narrator begins the story. One day in their modest house in Longbourn, Mrs. Bennet shares some news with her husband, Mr. Bennet. A wealthy young gentleman, Charles Bingley, has just rented the nearby estate of Netherfield. Mrs. Bennet twitters with excitement because she wants him to meet her daughters and hopefully marry one. One of the most famous lines in literature, the opening establishes the pursuit of marriage as central to the social world of the English gentry. In addition, the claim that a wealthy man must be looking for a wife shows how desperately important it was for women to marry wealthy men. In Austen's time, they had no other means of support. Mrs. Bennet asks her husband to get them an introduction. Mr. Bennet purposely frustrates his wife by sarcastically replying that he'll write to give his consent for Bingley to marry any of his daughters, especially Elizabeth, whom he considers especially bright. In terms of taking an interest in their daughters' futures, Mr. Bennet and Mrs. Bennet are polar opposites: she gets involved while he remains distant and makes jokes. Fyfe, Paul. "Pride and Prejudice Chapter 1." LitCharts. LitCharts LLC, 22 Jul 2013. Web. 22 Apr 2019. Fyfe, Paul. "Pride and Prejudice Chapter 1." LitCharts LLC, July 22, 2013. Retrieved April 22, 2019. https://www.litcharts.com/lit/pride-and-prejudice/chapter-1.